Elizabeth is at a crossroad. Will rumschpringe lead her away? Or bring her home? She's been given the chance to experience life outside of her community, away from the responsibility to care for her eight younger siblings, but Elizabeth Bontrager can't decide which road to take. Goshen has its charms and pressures, but Paradise, Pennsylvania, sounds . . . well, like paradise. And it's also home to her Englisch friend, Paula. Decision made. Elizabeth is Paradise bound. But will the small town live up to its name? When Elizabeth meets Paula's friend, Bruce, she quickly learns he wants more than a friendship. And the same might be true of Saul Miller, her new boss at the country store that sells Amish products to the Englisch community. As the two compete for her attention, Elizabeth is surprised to realize she misses her family and becomes even more uncertain about where she belongs. She has a choice to make: return home or embrace this new life and possibly a new love? I enjoyed going with Elizabeth on her journey. She basically jumped on a bus after some quick good-byes to family, and ventured into the unknown to start living her own life. She meets Saul in a sweet way, and they slowly build a friendship as a foundation for something more. Paula is one of my favorite characters- what a loyal and supportive friend through all of the transition Elizabeth goes through. The message that God watches over each of us was inspirational. Tess has taken some ribbing from her fellow officer, Logan, for her quilting hobby. He finds it hard to align the brisk professional officer he patrols with during the day with the one who quilts in her off-time. Besides, he's been trying to get to know her better and he'd like to be seeing her during those few nights a week she spends with her quilting guild. Then one afternoon Tess and Logan visit her aunt in the nursing home, and the woman acts agitated when Tess covers her with the story quilt. Aunt Susan is attempting to communicate a message to them about Tess's uncle. There's a story behind this quilt, they realize, one that may lead them to a serial killer. Will they have a chance to have a future together, or will the killer choose Tess for his next victim before they find him? 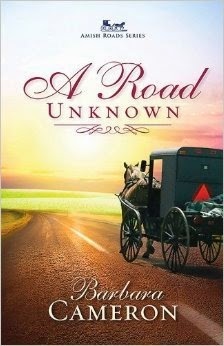 I love Barbara Cameron's Amish stories, so I wasn't surprised that her quality writing carried over to another genre for this suspense novel. The beginning was rather slow as we are introduced to the characters, but quickly picks up the pace as Tess and Logan start investigating their first case together. Much of the conversation between them happens over meals shared- it seems they are always eating! :) I loved the level of anticipation from their relationship progressing as well as the mystery of who-done-it. Subtle clues begin to appear about midway through the novel that reveal the killer to the reader, so the ending is not quite a surprise but suspenseful nonetheless as Tess and Logan get closer to solving the case. This has been my favorite so far of the Quilts of Love series. (Sidenote: the publisher's synopsis above isn't quite true to the story, so don't let it prejudice you towards Logan, who is actually more gentlemanly than it implies). 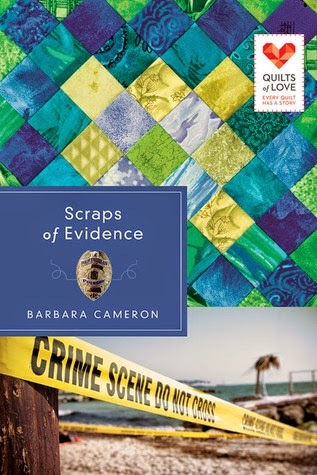 Scraps of Evidence by Barbara Cameron is free for download TODAY ONLY! It's part of the Quilts of Love series. I'm currently reading it and will be reviewing it soon! Tess has taken some ribbing from her fellow officer, Logan, for her quilting hobby. He finds it hard to align the brisk professional officer he patrols with during the day with the one who quilts in her off-time. Besides, he s been trying to get to know her better and he d like to be seeing her during those few nights a week she spends with her quilting guild. Then one afternoon Tess and Logan visit her aunt in the nursing home, and the woman acts agitated when Tess covers her with the story quilt. Aunt Susan is attempting to communicate a message to them about Tess s uncle. There s a story behind this quilt, they realize, one that may lead them to a serial killer. Will they have a chance to have a future together, or will the killer choose Tess for his next victim before they find him?